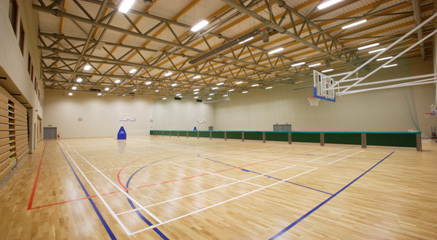 Shoreline Leisure Centre’s Sports Hall is a state of the art multipurpose facility. It is large enough to provide 8 badminton courts and is suitable for a variety of activities such as indoor football, Basketball, gymnastics and children’s activities, including birthday parties. We have also hosted a number of successful major sporting and special events. The main arena offers tiered seating for up to 530 people and alternatively it can be split into two courts. The hall has a sprung floor and caters to the needs of people of all ages and all sporting abilities. Many clubs and associations use the hall for a wide variety of sporting activities.